The Journey – 1880 – The first four founding Sisters, Sr M Hyacinth, Sr M Teresa, Sr M Joseph, Sr M Clare left Perthville, NSW Australia to begin the New Zealand branch of the Sisters of Saint Joseph in Wanganui, in the central North Island. The first schools – a primary school and a secondary school for boarders were opened that year. 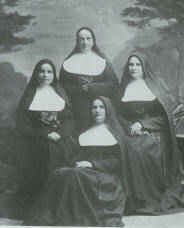 The first four founding Sisters pictured right (from left): Sr M Hyacinth, Sr M Teresa, Sr M Joseph, Sr M Clare (in front). 1982 Sacred Heart Convent demolished. New convent, Nazareth, opened. Mt St Joseph becomes Administration Centre. 1987 Nazareth begins as a Rest Home. Te Kainga Wairua opened. The house run as a partnership between the Sisters and Maori community as a way of beginning to honour the Treaty of Waitangi.